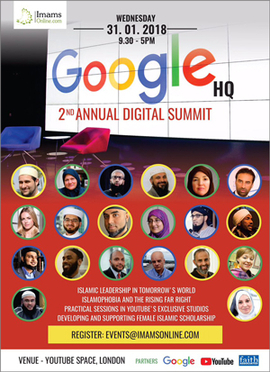 This Wednesday's online conference by the British-based Imams Online features a rogues' gallery of Islamists and virulently anti-Semitic, anti-Israel speakers – and it's all being done "in official partnership with Google and YouTube. "Islamophobe is what politically correct bullies call people like you and me when we call out radical Islam for what it is," says Muslim reformist Raheel Raza. "...They actually call me, a practicing Muslim woman, an Islamophobe. Why? Because I speak out against radical Islam." But spreading the false claim of rising Islamophobia actually can be seen as a national security threat. This is because that concept is based upon the false notion that there is a Western conspiracy against Islam – and that is the primary claim and motivation that induces jihadi terrorist attacks on western targets. "Islamists hope to insulate themselves from charges of supporting jihadi violence by shooting off accusations of 'Islamophobia,'" Middle East Forum President Daniel Pipes, himself smeared as an "Islamophobe," told the Investigative Project on Terrorism (IPT). "Sadly, not only do many not-too-bright individuals of good will fall for this deception, but in the process, this ploy becomes a national security threat by confirming jihadi paranoia about the world being out to destroy Islam." "For Google and YouTube to provide a worldwide forum for a group that includes known antisemites and bigots is irresponsible and beyond the pale," said Rabbi Marvin Hier, founder and dean of the Simon Wiesenthal Center. "Rather than promote tolerance and human dignity, it provides them with an enormous platform to further spew their anti-Semitism and hate! We call on Google and YouTube to immediately cancel the event!" Google's participation in the Imams Online summit stands in sharp contrast to its ongoing censorship of pro-Israel voices, including Prager University. Google-owned YouTube has restricted access to Prager U's pro-Israel videos and has removed dozens of other videos for no apparent reason other than Google does not like Prager's politics. It has likewise censored pro-Israel videos by Alan Dershowitz. This double standard belies its claims of neutrality. Google is not the first social media giant to enter into a partnership with this highly questionable Islamic group. Faith Associates, the parent company of Imams Online, partnered in 2016 with Facebook and Twitter. And in a similar action last November, Facebook partnered with the Muslim group Faith Associates to launch an online guide entitled "Keeping Muslims Safe Online," targeting "hate speech." Facebook has never offered a similar guide for other religions. Simon Milner, Head of Policy UK at Facebook, stated: "We're proud to be supporting Faith Associates in the development of their online safety guide. Facebook welcomes all communities, and there is no place for hate on the platform." Yet investigative journalist and lawyer Judith Bergman noted at the Gatestone Institute: "It is curious that of all the groups Facebook could have chosen to 'protect' – if one is to believe that Facebook intends to 'protect' other groups as well – it chose Muslims. Are Muslims the most targeted group in the world today? In Canada, according to fresh statistics, hate crimes against Muslims have fallen while hate crimes against Jews have risen. In the United States, according to Gatestone's A. Z. Mohamed: 'Since 1992... anti-Semitic incidents have been higher than those perpetrated against other groups.'"